Spruce lets you communicate with patients in two ways. 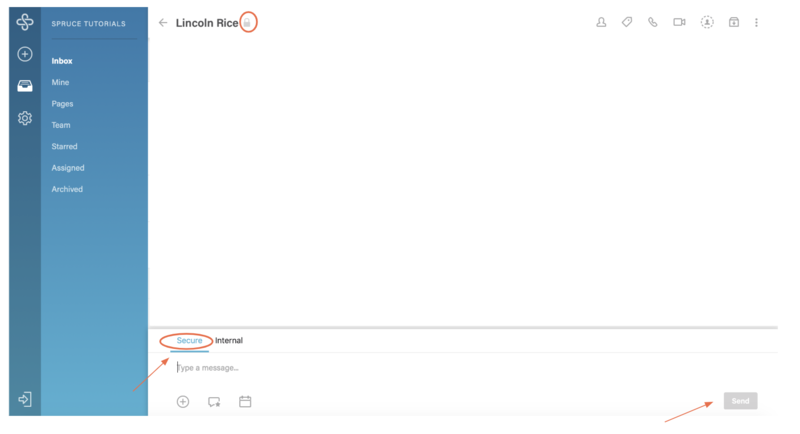 Secure Conversations include activity that takes place entirely within the Spruce app, including secure messages and video calls. 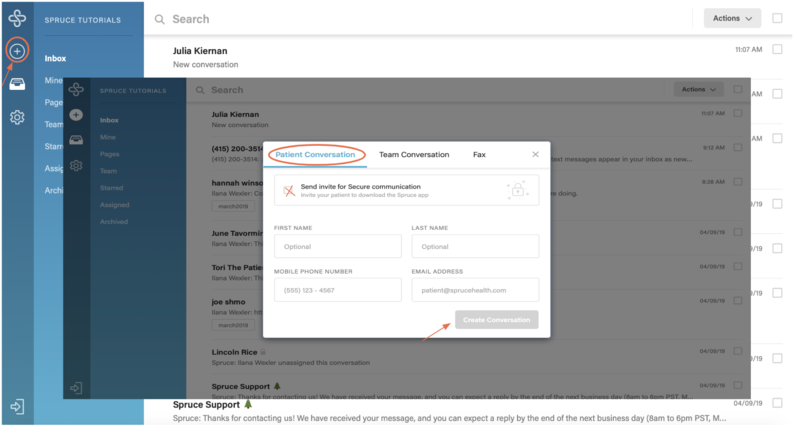 Standard Conversations include activity that goes outside the app, like standard text messaging and email. 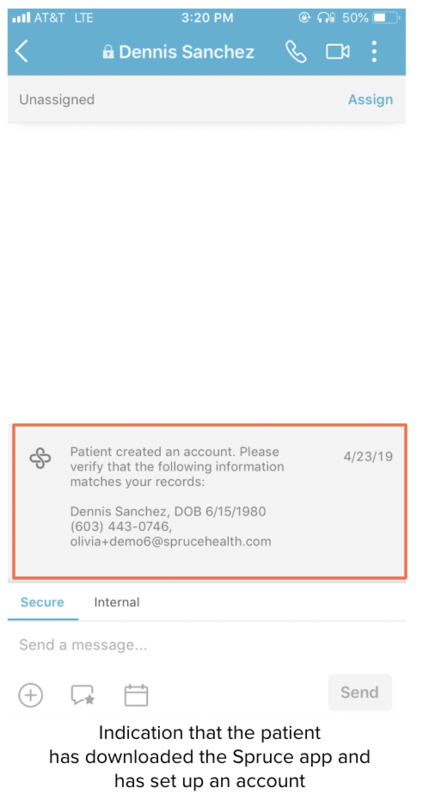 Secure Conversations are only possible with patients who have downloaded the Spruce app and set up an account. To initiate this, you can send your patient an invitation to download Spruce. Once your patient has the app and sets up an account, you can exchange secure messages and conduct video calls, as well as using telemedicine features like Spruce Visits and mobile billing. All of this activity will live in the patient's Secure Conversation. When your patients download the Spruce app, Spruce needs to know they are associated with your practice. We do this by creating a Practice Link that connects your patients to you. This link takes patients to a simple website with basic information about your practice that links to the app store. Before you start a new Secure Conversation using the steps below, contact Spruce Support to receive a customized Practice Link to send to your patients. Once you create a new Secure Conversation following the steps below, you will see a Lock Icon next to the patient's name in your inbox. The Lock Icon indicates a Secure Conversation. Standard Conversations do not have a Lock Icon. After you create a Secure Conversation, your patient needs to accept your invitation and set up their account before they can exchange secure messages with you. You will know this is complete based on a banner posted in the Secure Conversation. You can start a new Secure Conversation and send a patient your Practice Link at the same time. From Spruce on the web, select the Plus (+) Icon and toggle to Patient Conversation. Check the box to Send an Invite for Secure Conversation, input the patient's contact information, and select Create Conversation. This will automatically send the patient a text message with your Practice Link so they can download Spruce and be connected with your practice. If your patient already has a Standard Conversation with you, you can also select the Three Vertical Dots in the upper right corner of your Standard Conversation and select Invite to Secure Conversation. 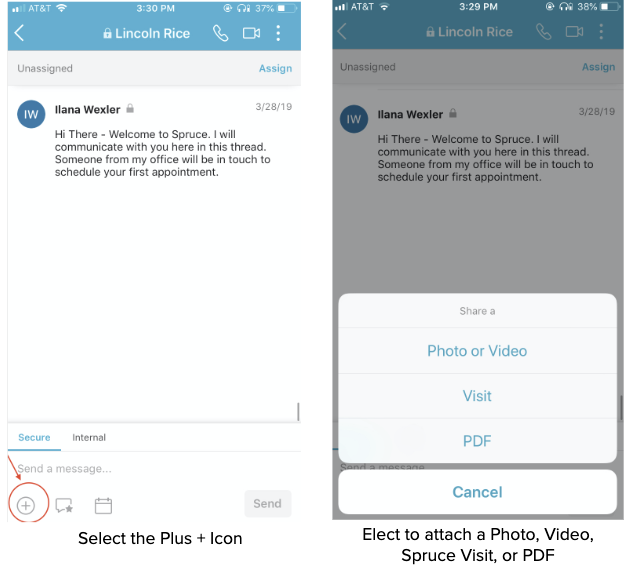 An invitation to download the Spruce app will automatically be sent to the contact information on file, and a new Secure Conversation will be created. Once the patient downloads the Spruce app and sets up their account, you can start sending secure messages and initiating video calls or other Spruce telemedicine features that your practice uses. Open the patient's Secure Conversation, select Secure in the compose bar, write your message, and select Send. On the mobile app, start a new Secure Conversation by selecting the Plus (+) Icon at the bottom of the screen. Select Patient Conversation, and check the box to Send an Invite for Secure Conversation. Input the patient's contact information, and select Create. This will automatically send the patient a text message with your Practice Link so they can download Spruce and be connected with your practice. Photo or Video: This option lets you send image and video files by taking a new photo or video or uploading one from your phone or computer. PDF: This option lets you send PDF files. Visit: This option lets you send Spruce Visits, which are adaptive clinical questionnaires that can be used for new patient intake, remote management of routine conditions, and follow-up. Care Plan: This option lets you send documentation that patients may refer to following an appointment. Care Plans can only be created through the Spruce on the web, not the mobile app. Payment Request: If you have integrated your Spruce account with Stripe, this option lets you bill and collect payments from patients.